There are no friends in the drug game. Sometimes there isn't even family that can be counted on, let alone trusted. When everybody is out to protect their own interests, survival becomes a primary instinct, eclipsing both the good and the evil lurking within each of us. 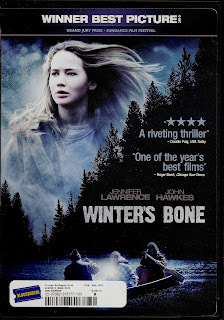 Seventeen year old Ree Dolly (Jennifer Lawrence)lives with her brother, sister and a mother who has never recovered from a breakdown. Ree is the adult in the house. The family lives in a dilapidated house in a rural town in the Midwest. Her father, a methamphetamine addict and "cooker", has been absent for several weeks, and misses a court appearance, which will cause the family to lose their home. Ree sets out to find him. Set against the backdrop of a cold and harsh winter, the people who populate Ree's town are starkly portrayed. Their hopelessness is palpable. The men are all involved in either using, or "cooking" crank, while their wives sit by in inexplicable silence. "This is just the way it is", seems to be the attitude. Ree will not accept this. Embarking on a journey to find her Dad pits her against everyone. Her relatives don't seem to want to help, and the town Sheriff is not to be trusted. Ree has just one week to find her father and turn him in. If she doesn't she loses the house and her family will be split up. There is one alternative - if her Dad is dead, and she can prove it, then the bail jumping charges will disappear and the family can survive. This movie will keep you interested and engaged as Ree struggles, against her father's family, and the law, in order to survive. Along the way, she learns just how hard she can be to protect what's hers. And with that realization comes the knowledge that she is just like everyone else. With it's sparse and tightly controlled Direction, this movie is a winner.